Sunday November 3rd 1878 I hurried with my work this morning so I might go to church, enjoyed the sermon very much. Mother and Rob went to the cemetery first thing after dinner. I finished up the work and got some things ready to take to John Henderson by the time they got back. Rob drove over there with me, Hatt went riding with John Whetstone. There was some girls over from town but they did not stay long. I wrote a letter to Amanda Anderson in the evening. This has been a beautiful day. 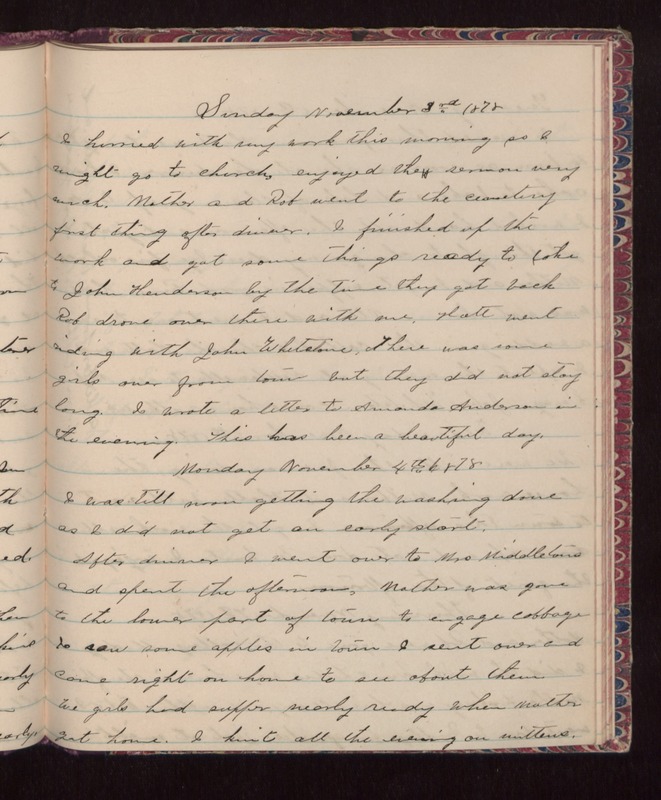 Monday November 4th 1878 I was till noon getting the washing done as I did not get an early start. After dinner I went over to Mrs Middletons to the lower part of town to engage cabbage. I saw some apples in town I went over and came right on home to see about them. We girls had supper nearly ready when Mother got home. I know all the evening on mittens.